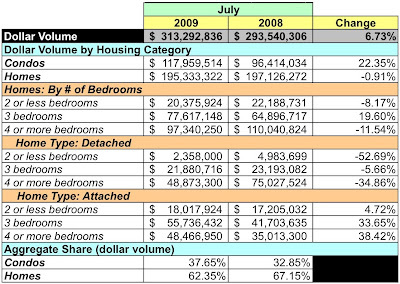 The S&P/Case-Shiller Home Price Indices report for June 2009 was released today. The report show "show that the U.S. National Home Price Index improved in the second quarter of 2009." The report's chart shows that nationally, home prices are back to "their early-2003 levels." 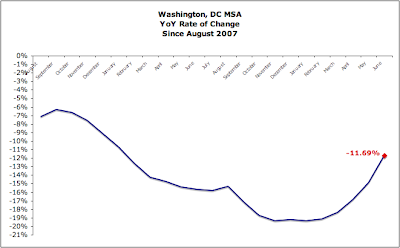 YoY, DC area prices are 11.69% lower. However, prices have increased each month since March 2009. 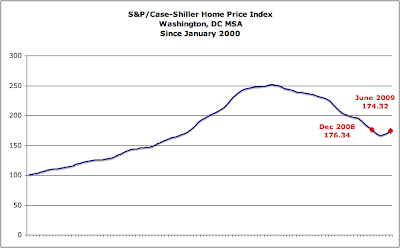 The DC area's home price index is close to that of December 2008. 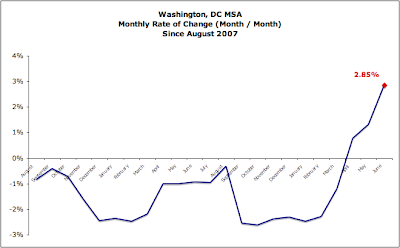 The charts below reflect home price data for the Washington, DC MSA. 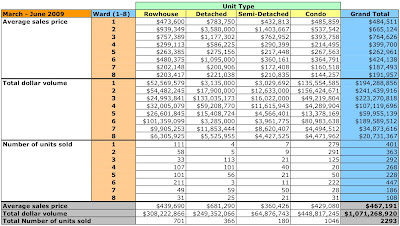 Despite my being on vacation last week, MRIS insisted on adhering to its schedule and last Monday released July's data for signed sales contracts for existing home and condos in the District. Sales and dollar volume are up and prices are lower than the same period last year. So, yes, sales are up and yes, the supply is dropping, but prices are still falling. 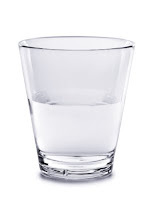 Keep the champagne on ice [if you're a seller]. Overall dollar volume was up 6.73%. It was an explosive month for condos, with a 22.35% upward movement. Homes ticked down by 0.91%. Attached homes were uniformly positive in their performance for the month. Sales volume was tremendous, increasing a robust 28.06% YoY. Condos and homes both shared in the positive growth, increasing 29.29% and 26.97%, respectively. However, all was not rosy if you were a seller: average prices fell 16.66%. Condo prices fared better, only declining 5.37%, while home prices tanked, dropping 21.96%. Not a single home category experienced higher prices in July. Of all homes and condos sold, 46 units - 7.1% of all sales - sold for more than $1MM. At July's sales rate, there is a 5.27 month's supply of condo units on the market, 13.86% less than June. For homes, 5.14 months, 6.97% less. 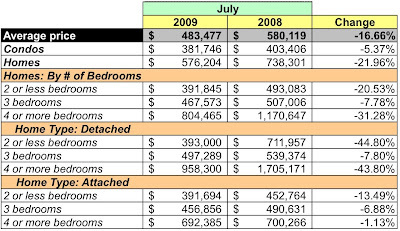 Compared to July 2008, the number of condos listed grew 3.5% and fell 2.7% for homes. Side note: I'm still processing District sales data for March - June. Before I can complete that work, upload the data, and post an analysis, I first need to attend to my "extensive" IT infrastructure and modify some Excel VB code that, quite honestly, makes this a more onerous task than it should be. We're off to the beach for the next few days. Why let Congress have all the fun? Don Rickles says it all! What's a seller to do? You read that home sales increased in June. The S&P Index is up 11% YTD. But, as of June 2009, the YoY US inflation rate is -1.4%. And, foreclosures account for a significant proportion of all home sales, nationwide. Your house, well situated a block from I-295, has been on the market for more than 90 days. In fact, its construction hasn't even been completed. What do you do? Raise its price by 4.76%, of course. That'll draw in the buyers! It's been a while since I've been able to do it, but I've begun processing sales data for the District. The table below depicts District sales for March - June 2009. As you can tell, I've got a lot of data to process. My buddies at UrbanTurf brought this news article from last weekend's WaPo to my attention. All I can say is, it irritated me to no end. "That long has been the custom, and I think an appropriate custom," said Dale Mattison, a broker with Long & Foster in Bethesda. "If you are a buyer, you are asking a seller to take the property off the market and to do so with a significant degree of good faith." Some people still think this is 2005, although today the justification's different: then it was "a seller's market," now it's "custom." Shall we discuss other things that were "custom" until outlawed by the feds? It's neither the broker's nor the seller's right to see the buyer's finances. That's between the buyer and the mortgage company. All anyone has a right to see is documented evidence, e.g., a pre-approval letter, that the buyer is capable of buying the house for the agreed to price. Regardless of whether you believe the pre-approval letter, the standard contract has a financing clause that handles the situation. "I want to see what their income is. I want to see the cash," said Jane Fairweather, a Coldwell Banker agent in Bethesda. "I want to know where are the dollars they are going to use, not only for the down payment, but for the closing costs. If they're putting 20 percent down, I want to see 25 percent in cash." Guess what? If I'm the buyer, you're not going to see it. You're not a licensed mortgage broker, you're not a certified financial planner, so how the hell do I know whether you understand what you're reading? Apologies to my real estate agent friends out there, but some real estate agents I used to work with could barely do 7th grade algebra. I understand agents are protecting their clients' best interests, but if they feel the information presented during execution of the standard transaction process is insufficient or that there are flaws in the process, then there's an easy solution: modify the standard real estate sales contract. Quit imposing extra-contractual information requirements on the process. In this market, might I suggest a new "custom": tell the seller to pound sand and move on.